← DE: This Sunday, How about Brunch and a Drag Show? 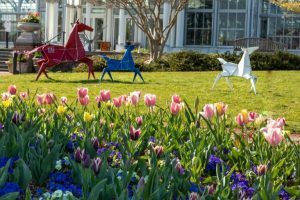 Richmond, VA Exit 83: A premier art exhibit of origami bronze, steel and aluminum sculptures is making its mid-Atlantic debut at Lewis Ginter Botanical Garden this spring and summer. 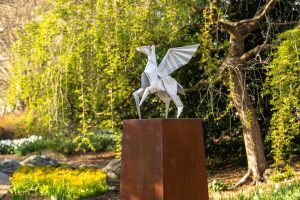 Origami in the Garden is an exhibition of larger-than-life outdoor metal sculptures inspired by the Japanese art of paper folding. Take a stroll and enjoy more than 21 sculptures arranged throughout the garden in 16 vignettes created by Santa Fe based artists Kevin and Jennifer Box. Some sculptures are over 7 feet tall; others are small as a mouse. 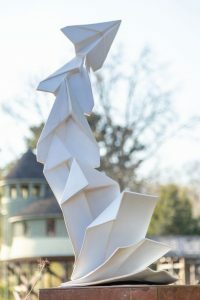 Sculptures are based on prototypes created with origami: one folded sheet of paper, no cuts. Artist Kevin Box uses a unique process he developed, the lost wax casting technique and fabrication, in order to capture the delicate details of paper and blows it up , colossal style, using museum-quality metals. 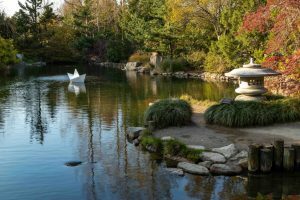 Installed throughout the Garden with many associated activities and programs this exhibit celebrates nature, the “master origami artist,” seen in everything from leaves unfurling to butterflies emerging from a chrysalis. This entry was posted in Articulture, Arts and Crafts, Culture, exhibition, Fun, Nature, Special Event, Virginia, Walking Tour and tagged activity, aluminum, art, artist, botanical, bronze, butterfly, capture, casting, chrysalis, debut, delicate, detail, developed, exhibit, exhibition, fabrication, folding, garden, Henrico, Japanese, Japanese art, larger-than-life, leaf, Lewis Ginter Botanical Garden, master, metal, Mid-Atlantic, Museum, Nature, origami, outdoor, paper, premier, process, program, prototypes, Richmond, Santa Fe, sculpture, spring, steel, stroll, Summer, technique, unique, vignette, Virginia, wax. Bookmark the permalink.